The greatest climate change the world has seen in the last 100,000 years was the transition from the ice age to the warm interglacial period. New research from the Niels Bohr Institute at the University of Copenhagen indicates that, contrary to previous opinion, the rise in temperature and the rise in the atmospheric CO2 follow each other closely in terms of time. 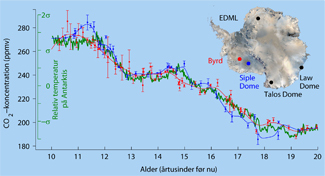 The results have been published in the scientific journal, Climate of the Past. The Australian ice core drilling camp at Law Dome in Antarctica. In the warmer climate the atmospheric content of CO2 is naturally higher. The gas CO2 (carbon dioxide) is a green-house gas that absorbs heat radiation from the Earth and thus keeps the Earth warm. In the shift between ice ages and interglacial periods the atmospheric content of CO2 helps to intensify the natural climate variations. It had previously been thought that as the temperature began to rise at the end of the ice age approximately 19,000 years ago, an increase in the amount of CO2 in the atmosphere followed with a delay of up to 1,000 years. 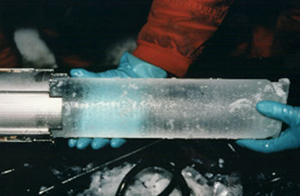 “Our analyses of ice cores from the ice sheet in Antarctica shows that the concentration of CO2 in the atmosphere follows the rise in Antarctic temperatures very closely and is staggered by a few hundred years at most,” explains Sune Olander Rasmussen, Associate Professor and centre coordinator at the Centre for Ice and Climate at the Niels Bohr Institute at the University of Copenhagen. The research, which was carried out in collaboration with researchers from the University of Tasmania in Australia, is based on measurements of ice cores from five boreholes through the ice sheet in Antarctica. The ice sheet is formed by snow that doesn’t melt, but remains year after year and is gradually compressed into kilometers thick ice. During the compression, air is trapped between the snowflakes and as a result the ice contains tiny samples of ancient atmospheres. The composition of the ice also shows what the temperature was when the snow fell, so the ice is an archive of past climate and atmospheric composition. “The ice cores show a nearly synchronous relationship between the temperature in Antarctica and the atmospheric content of CO2, and this suggests that it is the processes in the deep-sea around Antarctica that play an important role in the CO2 increase,” explains Sune Olander Rasmussen. Antarctica play an important role in the rise in CO2. He explains that one of the theories is that when Antarctica warms up, there will be stronger winds over the Southern Ocean and the winds pump more water up from the deep bottom layers in the ocean where there is a high content of CO2 from all of the small organisms that die and fall down to the sea floor and rot. When strong winds blow over the Southern Ocean, the ocean circulation brings more of the CO2-rich bottom water up to the surface and a portion of this CO2 is released into the atmosphere. This process links temperature and CO2 together and the new results suggest that the linking is closer and happens faster than previously believed. The global temperature changed naturally because of the changing solar radiation caused by variations in the Earth’s orbit around the Sun, the Earth’s tilt and the orientation of the Earth’s axis. These are called the Milankowitch cycles and occur in periods of approximately 100,000, 42,000, and 22,000 years. These are the cycles that cause the Earth’s climate to shift between long ice ages of approximately 100,000 years and warm interglacial periods, typically 10,000 – 15,000 years. The natural warming of the climate was intensified by the increased amount of CO2 in the atmosphere.